Times are changing fast. Traditional working practices and the concept of a conventional job are increasingly becoming things of the past as we make sense of a new marketplace where the only limit to success is our own imagination. What Does it take to Survive in This New Scrambled Up World of Work? The challenges - and the opportunities - for the 'entrepreneur-within' the huge. For micro-businesses, home-workers, freelancers, it's all for the taking. That is the essence of LEAP! A stimulus for taking the plunge to go it alone and set yourself free... and for making it up as you go along! 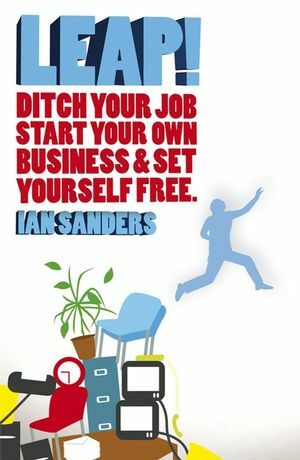 Ian Sanders has been ‘doing it himself’ for seven years as a business and marketing consultant. He has helped launch new ventures in radio, television, design and music. His current marketing company, OHM, (Outhouse Media), has clients that range from global brands such as Benetton to the small business around the corner. Ian’s skills are in bringing common sense advice and fresh perspectives to clients whatever their size, helping them to exploit their market potential. With more and more of his contacts setting up by themselves, Ian was inspired to write up his experiences in Leap! With his eight years as an independent and another ten years working for others, his mix of experience, insight and ideas makes him best placed to guide others through this new scrambled up world of work. Ian is passionate about enterprise, about doing it differently and reinventing to succeed. He currently lives in Leigh-on-Sea with his wife, Zoë, and two children. 2 Make sure you’re hungry. 4 Get known for being a safe pair of hands. 9 Warning: steep incline ahead. 10 Get involved and get visible. 11 Don’t listen to anyone who says ‘no’ to your ambition. 13 Follow your gut feeling. 14 Leverage what you’ve learnt. 15 Get out of the classroom. 16 Knock down the barriers. 20 From city trader to sole trader. 23 It’s a risky business. 4 Making something (anything) out of nothing. 5 Wrapping up your know-how. 6 ‘Sell’ is not an expletive. 8 Learn to juggle … well. 9 Turning a contact into a client. 11 Make sure you are valued. 13 Enterprise is the only way. 14 Why being a chameleon can be a good thing. 15 A toe in the water. 16 Funding ain’t often fun. 17 The power of collaboration. 19 Know how to make money. 22 Different kinds of profit. 23 What is ‘core business’ anyway? 30 Living off your latest gig. 1 Starting up and fi nishing up. 3 You don’t need big tools. 4 Business doesn’t come in a flat pack. 5 The six-point business plan. 6 It’s who you know (of course). 8 Get yourself a mentor. 9 Polymaths have all the fun. 10 What do you do again? 15 The importance of scribbles on little scraps of paper. 16 Learn to say ‘no’. 17 Know when to shut up! 20 Consume the world of your client. 21 Here’s to a damn good lunch! 25 When to walk away. 27 Get it right online. 28 Don’t hide from the customer. 32 Get your hands dirty. 33 Don’t give too much away. 34 Think ‘entrepreneur’, not ‘freelance’. 35 Avoid those faux pas. 1 If you don’t want to know the score, look away now. 2 It’s a life thing. 4 Do you love stress? 5 A space to work. 9 Benchmarks that really count. 11 There is always an alternative. 12 A love of speed. 13 From feast to famine. 14 What is ‘the working day’? 15 Budgets, business plans and babies. 16 Trying to switch off. 19 No rungs on the ladder. 20 Who wanted a job for life anyway? 21 The importance of self-sufficiency. 23 Making it up as you go along. 25 What you do, not where you are. 27 Is there any going back? 28 A new way of being. 29 Now, the end (or, actually, the beginning). Appendix: Tales from the frontline of the scrambled up world of work.